Cisco-Eagle Catalog - Pallet Positioner, 43&quot; diameter top, 4500 lb. Cap. Lifts, Cranes & Hoists > Pallet Positioners, Turntables & Tilters > Pallet Positioners > Pallet Positioner, 43" diameter top, 4500 lb. Cap. Pallet Positioner, 43" diameter top, 4500 lb. Cap. This pallet positioner helps the operator load or unload pallets at the ideal ergonomic work height. 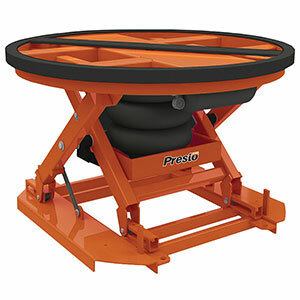 It is self-leveling, so the load remains at a comfortable working height as items are added or removed. The rotating platform puts the load right in front of you to minimize stretching. It rotates easily, with a minimum of force; just push it and it moves. The positioner has a 4500 lb capacity in the holding position and 1500 lbs in lifting capacity. Base Dimensions: 48" x 28"
Low/Raised Ht. : 9.5" / 30.5"
Powered Pallet Truck - 4000 lb. Cap., 27" x 48"